A fantastic eight bedroom fully licenced HMO offering smart living space arranged over three floors with large reception room/kitchen, conservatory and charming patio garden, providing great investment opportunity. The property is ideally located close to a wide variety of shops and amenities in New Malden. Close to the A3 for motorist links in and out of London. Local bakery renowned for its sandwiches. A bright, modern restaurant serving Chinese and Japanese noodles and dim sum. 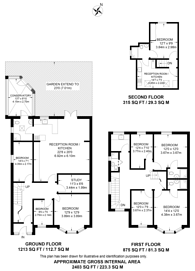 2,403 (223 Sq M) approx.